This tea-house has a wonderful garden around it. All the seasonal trees and flowers needed to keep the garden alive throughout the year can be seen. 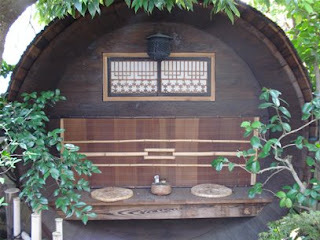 The garden also has two very cute Machi-ai / waiting huts near the tea-house. One is directly next to the Chashitsu / tea house and is made from another big barrel of the same kind as the tea house. The second waiting room is a little further away in the garden and has a beautiful stepping stone path leading up to it. Everything seemed so perfect for a tea ceremony that I surely will go back there and try to arrange something.